Herbs and spices have been used to flavor our food for hundreds of years. Our ancestors soon found out that certain herbs also come with powerful health benefits. Some of the most common herbs and spices you eat might be helping your body in more ways than you can imagine. 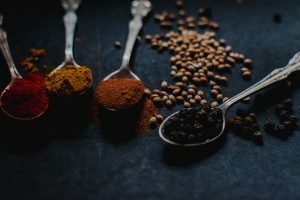 Today, we will look at some of the most common spices that provide health benefits and adds a great kick to your meals. Herbs and spices made their way around the world in the old days and were as highly traded as gold. One of the most popular spices was cinnamon, which is used in many recipes and baked goods today. Cinnamon has the ability to fight inflammation, due to its high antioxidant activity and can even help fight high cholesterol. Cinnamon can also help lower blood sugar, and it improves insulin sensitivity. As for peppermint, it has been used in many different recipes not only for a fresh taste but for its healing properties as well. The chemicals inside of peppermint provide pain relief and is used to treat flatulence, menstrual pains, depression, indigestion, and much more. My favorite spice ever has to be cayenne pepper; there is nothing quite like its kick. Capsaicin is a key ingredient in the spice, which reduces appetite and increases fat burning properties when eaten (for those who don’t eat peppers regularly). Although no clinical trials have been done, cayenne pepper has also shown anti-cancer potential in animal surveys. Another powerful seasoning is garlic. Garlic isn’t only used to ward off vampires; it has been used to fight sickness for many years. Garlic is filled with allicin, which is used to lower cholesterol, high blood pressure, and reduces inflammation. It is important to note that you only receive these benefits from chopped or crushed garlic. Basil is known for its anti-inflammatory and antiviral properties. Even better, it can be in almost every dish. The herb is also a great way to naturally boost your immune system. Additionally, it acts as an adaptogen, which helps you deal with stress. With its many health benefits and amazing taste, you should be adding basil to everything you eat! Similarly, cumin is one of the most used herbs in the world, providing great taste and even greater health benefits. Besides a common use for indigestion, cumin is rich in iron. More impressively, it can help with treating diabetes, and it can improve blood cholesterol by taking recommended amounts from your doctor. There are many other herbs and spices that have incredible health benefits. We hope this article provides you with a new outlook on what’s in your spice cabinet.